“In the meeting, everyone watches their conversation take shape. Everyone can see the work made tangible on the map. Everyone can find clarity within the complexity through a well-organized drawing. Marianne Williamson says, “Magic happens when you tell the universe what you want it to do for you; miracles happen when you ask how you can be of service to the universe.” My favourite role in all my various work has always been listening. Deep listening is my way to be of service, an active, not a passive, art. My friend and mentor Michael Walsh gave me great advice. Instead of trying to do better what you do least well, and hoping to be average at that thing, focus on what you already do well and do it better. He said, “Figure out the thing you are great at and then become a genius at it.” When we surveyed folks who deal with our agency, Spectrum Society, we were surprised to hear that one of the things they liked best was our ability to listen. 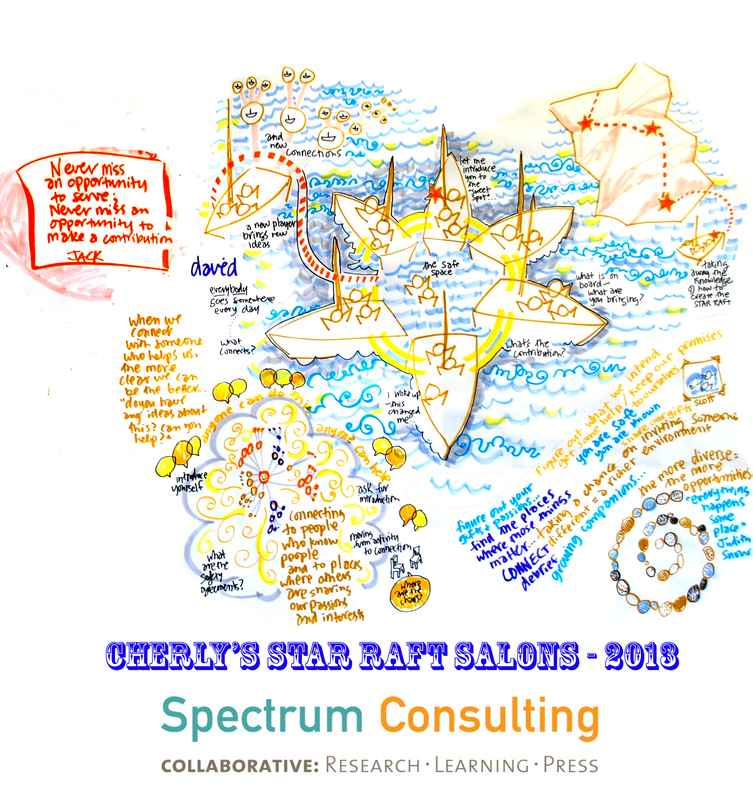 We began to strive for optimal in our listening… and for me, that led to graphic facilitation. And it almost all happens in real time (synchronously). Even though it has been estimated that as many as 85% of us are visual learners, and it is an axiom of adult education that adult students need to find ways to participate, and know that they are heard and valued, we still default to methods that are lecture-like and reminiscent of old style classroom “talk and chalk” pedagogy rather than facilitating dialogues and “conversations that matter,” to quote Juanita Brown’s World Café theory. Yet we do know how to do things better. 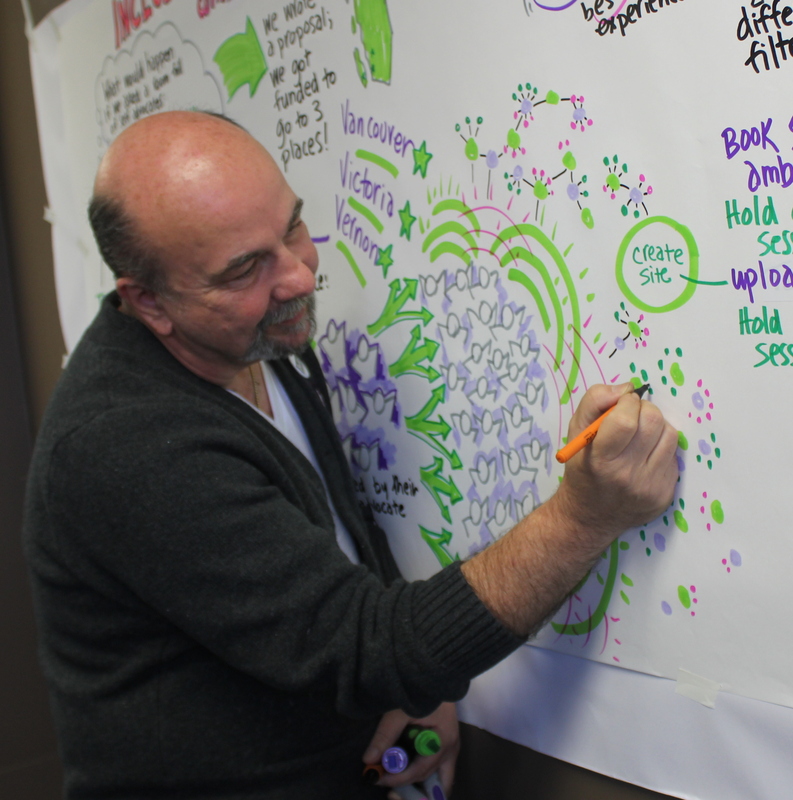 Graphic facilitation can work flexibly for a whole range of conversations. If someone is lecturing, it can clarify and make points memorable. If they are creating opportunities for dialogue those can be not just enlivened but clarified. In both cases, what is created – the map of the mind of the room – becomes the documentation of the experience, a thing which can be referred to later (“What did I agree to do?”) or built upon as a clear, positive map to the future (if we start here… we might go there!) for one’s team. Focus, concept clarity, memory and understanding are all furthered in ways that are colorful, personalised and empowering. Often, people will ask how they can encourage more feedback, get more investment, widen their reach beyond their small community of special interests to the wider world… we have found a few ways to do this. First, through practicing and planning invitation. Create an event that itself expresses the gifts your community offers so that everything about it from pre-event to wrap up and publicity in the media says “We’re here, this is what we bring, please join us.” Think “pot-luck” (even if it is a catered event). What’s the “special sauce” that people look to you to contribute? Second, ask, in how many ways can we convey welcome and appreciation? Part of this is ensuring good facilitation and listening. Most of us have been part of conversations and meeting where we didn’t feel heard, and walked out at the end of the day feeling tokenised and discouraged. Plan for fun, comfort and feeling heard. 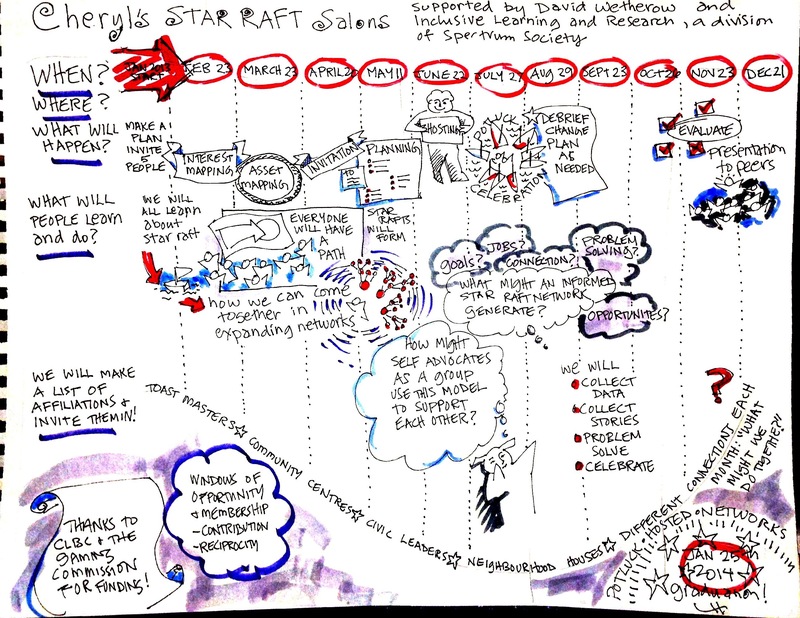 Third, share a vision – what is the community and network you dream of? Once your network becomes clear, it is possible to break things down into actionable goals and set some milestones to track so that even over a very long term plan we always know when we’re on track. The right partners, combined with the right vision, will compel action. One of the things I love about graphic facilitation is watching people’s shoulders drop as they see what they’ve just said recorded on the paper. I’m not sure if I imagine this relaxing but it seems evident to me. Feeling heard, they can begin to listen to others. At a recent meeting one of the participants, not in agreement with the majority, stood up and said the thing she had been saying all day, yet again, (and apparently had been saying for years) and she said that she wasn’t feeling heard. The group pointed to the part of our drawing that documented her ideas, and then how that part led to another part, and back to the whole. Her relief was palpable from across the room and she was delighted to find she was not merely perceived as in disagreement but was being actively engaged as part of the solution seeking. Each graphic facilitator offers something slightly (or very) different. In my case, I studied fine arts and graphics full time and then worked in organizational leadership, for the past 30 years. I have been a leader at various levels, a facilitator, a free lance writer on the gulf islands, hobby farmer, foster-parent, illustrator and production silk screener. For two years I studied business practices and leadership with Michael Walsh of Kaizen Consulting, and a cohort of entrepreneurs. I have degrees in fine arts, homeopathy, literature and education theory, and a Master’s degree focused on disability and leadership (equity and education). As a speaker to large and small groups, I develop and present curricula on a range of topics, and I love research projects and research methodology, particularly qualitative (story based) and participatory research methods. I am also the co-author and illustrator of two books, the editor and contributor of two anthology, and have a new book coming out, Renegotiating Reciprocity – Supporting people with intellectual disabilities in our families, workplaces and neighbourhoods. I love social media and the internet. I bring all of this to our shared experience when we work together. Here is some feedback from others on our work together.